The Handmaid’s Tale [Mini-Review] – my books. my life. You all know the premise of The Handmaid’s Tale, right? In a future where religious extremism has taken over and fertility rates have plummeted, women are “recruited” and given to the powerful men to bear their children. What makes the book extra horrifying is that the world that exists happened relatively slowly, starting with changes that occurred in response to similar issues we see in our world today. The book gives you little by little, giving some information but always leaving you wanting to keep reading to know more. The plot doesn’t really move quickly but it does always seem to be moving. Something made me want to just keep reading. I am glad that I finally read this classic Dystopian book. With all of the Dystopians we are overwhelmed with today, it’s nice to get to one we know will endure. Read this in college and loved it. Must go back and re-read it one of these days. Haunting. This is one book I have not yet read, and I hang my head in shame. I know I would love it. Maybe I can get my book club to read it, just to force my hand! I’m glad you finally read this and I’m glad you liked it. Because the extremism took hold gradually, it certainly does make it a scary sort of book because it seems like it could be real someday. Hope you have fun on the rest of your trip!! I read this book many years ago, and was blown away by the implications and worldbuilding that it created. 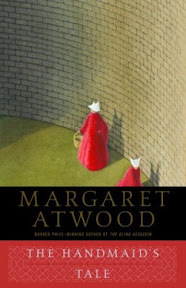 It is one of Atwood’s best, in my opinion, and even though she has done many other dystopians, this one was my favorite. Great review, Michelle, and I am glad you liked it!